In direct contention with the pervading assumption that international aid is critical for the survival and eventual growth of the most impoverished countries, Dambisa Moyo contends that aid has actually inhibited these countries from achieving sustainable economic growth. Instead of providing a basic level of sustenance for a country, aid encourages corruption and locks a country into a cycle of debt that prevents viable economic sectors from developing. In this opposition, Moyo recommends a combination of foreign direct investment, intentional and regional trade, bond markets, increasing domestic savings, and reducing the costs of remittances while tailoring these options to the specific circumstances of each country. There are three factors that have contributed to a resurgence within the African economies: the rise in commodity prices, the benefits of a positive policy dividend from the market-based policies instituted in the 1980ss, and notable strides in the political landscape. That being said, the current situation is still incredibly challenging (3-5). There are three types of aid:  humanitarian or emergency aid, , charity-based aid,  systematic aid (7). Moyo focuses on systematic aid and defines it as the sum total of both concessional loans and grants between countries (8-9). The development agenda following the Bretton Woods conference marked the first recognition of an international development agenda in the 1940s. This agenda focused on producing a cash injection for the devastated economies of Europe following World War II. This effort has largely been considered an unrivaled success (10-12). The success of Bretton Woods translated into optimistic assumptions that similar cash injections through aid could assist developing countries, particularly Africa, by the mid-1950s (13). The 1960s saw greater attention to large-scale funding for infrastructure projects from aid (14-15). As a result of the food and commodity prices shocking fuel by the rise oil prices in the 1970s, development became far more poverty oriented and no longer focused on infrastructure projects (16). Following the 1979 oil crisis, policy makers began focusing on tightening monetary policy. For example, the IMF formed the Structural Adjustment Facility to impose restructuring programs on countries requiring loans. Combined with the increased affinity for neo-liberalism of the 1980s (an international relations paradigm that advocates for the loosening of government regulations in favor of the private market), stabilization and structural adjustment dominated development thinking of the time. Stabilization included reducing a country’s economic imbalances such as its import-export ratio while structural adjustment included trade liberalization through the removal of trade subsidies. This would culminate in the Washington Consensus and become the backbone of development strategy by 1989 (18-22). Development policy shifted once again in the 1990s as the failures of past aid-based development model became increasingly apparent. The cost of servicing previous debt by African countries outweighed the inflow of aid, creating a reversal flow of funds. Ineffective political leadership and weak institutions were blamed for Africa’s economic woes. Western institutions began attempts to reform governance, instilling democracy within struggling economies. Others advocated for eliminating debt as a development strategy (22-26). The 2000’s have been marked by the commercialization of aid through celebrities like Bono that call for increased aid in addition to the elimination of current debt. This is not a viable solution however, it merely replaces old debt with new debt (26-28). 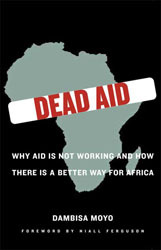 Typical explanations for why aid does not work are geographical, historical, cultural, tribal, or institutional. While Moyo acknowledges that these factors have certainly impacted development to varying degrees, she asserts that by far the unifying theme of countries that struggle with development is their dependence on aid (29-35). The Marshall Plan is frequently cited as an example of aid working. However, the Marshall Plan differs greatly from the context of development aid. The Marshall Plan only delivered a fraction of GDP, was finite, injected cash into previously functioning institutions, and focused primarily on infrastructure. None of these aspects hold true for development aid (35-37). Proponents also point to the so-called International Development Association (IDA) graduates that consist of the most notable emerging economies like China and India. Once again, aid flows to these countries were relatively small with short durations (37-38). Aid is said to work with conditionalities, regulations attached to aid that encourage any given country to reform in certain ways. However, these regulations are rarely enforced and aid continues to flow even when the regulations are openly violated (39). The policy environment is cited as a prerequisite for effective aid. Development will not occur until democracy and sound fiscal, monetary, and trade policies are enacted. Moyo explains that democracy does not lead to economic growth, it actually needs economic growth to strengthen (40-44). Evaluations of aid tend to be confined to short term metrics. In other words, delivering 10,000 mosquito nets to Africa focus on the immediate impact on communities having the nets. Little attention is given to the several local mosquito net makers that go out of business, further weakening the economy. Furthermore, little thought is given to what happens after the mosquito nets have torn and are no longer used. Aid evaluations must include second, third, and fourth order effects on the economy so as to accurately reflect the impact of aid(44-45). Countless empirical academic studies have concluded that aid does not encourage development (46). Aid produces rampant corruption by propping up corrupt governments that severely impact the development of critical institutions such as small business, the rule of law, and efficient government (48-49). Rent seeking becomes a consistent problem of aid: the procurement of money by government authority without the production of wealth of through trade (52-53). There are two reasons why Western institutions continue to lend despite rampant corruption: the pressure to continue lending and a lack of consensus on which countries are corrupt and which ones are not (54-56). There are four economic challenges introduced for a country receiving aid:  reduction of domestic saving and investment in favor of greater consumption,  inflation,  diminishing exports, and  the difficulty in absorbing large cash influxes(60-65). Even if aid could be shown to be a producer of economic growth, there are two other reasons to pursue alternatives. First, donors are growing weary of granting aid. Second, both the recent global financial crisis as well as aging populations throughout the west have placed donor countries under a great degree of financial strain, limiting their ability to secure funds for aid (74-75). Accessing bond markets is a far more viable option for accumulating capital but must be done in a series of stages. First, the country must obtain a rating from an internationally recognized rating agency. Second, the country must woo investors. Once investors have been convinced of the country’s commitment to repay and terms have been agreed upon, the country secures more capital (78). There is a great deal of interest in emerging economies at the moment which should be fully utilized by countries seeking long-term development goals (79-81). In the case that a country does default, there is no reason it cannot reenter the market as long as it addresses the underlying problems that produced the default (86). Assertions that struggling economies cannot tap international bond markets is not correct. Countries have chosen to forgo this type of capital. For the few countries that will seem as too hazardous for investment, there are three options. Risk can be pooled regionally or between groups of countries. Other countries can offer insurance or payment protection to the investor if the initial country defaults. A guarantee structure has also proven effective. An international organization only guarantees the first bond of several. As that bond is repaid, the guarantee rolls over to the following bond in sequence. Securitizing a bond is another option: the process of allocating specific cash-flow to repay the debt such as oil revenue (94-95). African countries must also improve its amount of foreign direct investment (FDI) in order to increase economic growth. Low labor costs and an abundance of investment opportunities make African an excellent choice for investors, however, lack of infrastructure and extensive bureaucratic and regulatory restraints outweigh the benefits of doing business in Africa. To change this, African policy makers must woo FDI investors in addition to building a regulatory and legal structure that supports businesses (99-102). China has been a significant source of FDI in Africa. Simply put, Africa has the resources that China needs to continue its astounding growth rates (103-105). Largely, China’s engagement with Africa has met with disapproval by the West. Africans tend to scoff at this because of the fact that it has often been the West’s aid and good will that has propped up some of the regions more ruthless dictators such as Zaire’s President Mobutu, Uganda’s President Idi Amin, and the Central African Republic’s Emperor Bokassa. China’s hassle-free, no questions-asked approach provides African leaders the opportunity to pursue their own reforms instead of attempting to meet the demands of Western policy makers (108). The 2007 Pew Report, Global Unease with Major World Powers (the link includes a summary, the data set, and the full report), found that favorable views of China have been increasing throughout Africa and more people tend to view China positively than they do the United States (109-110). Developing trade between Africa and the globalization market will be essential to long term growth. Due to political pandering and the desire to maintain a vibrant agricultural base for strategic concerns, the West has protected its agriculture through subsidies and trade restrictions. Developing countries are then unable to compete in agriculture, crippling their ability to trade in a globalized market. Beyond the West, many other countries also enact similar trade barriers on agriculture such as China, Turkey, Brazil, Mexico, Egypt, and India. By far the most serious problem is between African countries. African countries place inordinate tariffs on each other and significantly curtail regional trade (114-117). While trade with China continues to be a lucrative opportunity for Africa, it should not depend on a single trading partner. Focusing on regional trade and removing inter-country trade barriers would go a long way in encouraging trade and increasing the ability for Africa to compete in the global market place (122-125). The Garmeen Bank pioneered a process of lending to the poorest sectors of an economy called micro-financing, The Garmeen model places borrowers into groups and lends nominal amounts, ($100 for instance) to one member of the group at a time. The group does not receive a second loan until the first is paid. While there is no joint liability, group members ensure that each others’ loans are paid in full. This model has achieved a large degree of success (126-127). Variations of the Garmeen model and incorporating much of the world’s poorest allows them to secure capital to promote economic growth. Over time, providing small loans to the previously unbankable has the prospect of developing enterprise and a successful economy (130). Remittances, capital flows from relatives or diasporas, account for a significant degree of capital flow into Africa and should not be hindered because they help pay for imports and repay external debt. In short, Africa countries should develop efficient and cost effective systems for those living abroad to send money home to encourage these capital flows (133-136). Savings provide another avenue of capital but Africa must provide transparent financial institutions in order to encourage saving throughout the continent (137-140). However, Africa cannot pursue these financial innovations as long as poor governance continues to plague the continent and raise the risk of investment. Since aid has directly encouraged and supported poor governance, aid-dependency must be resolved by no longer granting aid (143). Aid should stop flowing to aid-dependent countries in five years. In the time being, a three stage process should be pursued. Developing an economic plan that reduces a country’s dependency on aid each year. FDI, trade, micro-financing, remittances, and savings all provide viable prospects for providing more capital in the place of aid. Reducing spending and trimming national budgets will reduce the amount of capital needed in the short term to give time for FDI, trade, and other investments the time to spur the economy. Strengthening institutions to ensure that progress is not lost and growth can continue to accelerate (145-148). A pivotal book. Moyo strikes an excellent balance between readability and thoroughness, referring to numerous academic studies throughout the book while keeping the writing and content easily accessible. Whether you are involved with development policy or have simply bought the latest (RED) iPod, you need to read this book. Moyo makes a compelling argument against broad intergovernmental aid. Nevertheless, one of the primary arguments of Jeffrey Sachs, the developer of the Millennium Development Goals and author of The End of Poverty, is that targeted aid to local communities that increases GDP per capita above $300 breaks the poverty trap and allows for economic progress to begin. Until that trap is broken, households cannot amass enough capital for reinvestment, which is critical for economic growth. As Moyo notes, massive flows of aid to any given country do not produce this effect. Rampant corruption, a lack of growth, and rent seeking by public officials become the norm. In short, aid may be able to alleviate poverty and jumpstart an economy but the problem is with the implementation. Unfortunately, there may not be a reliable way to deliver aid to local communities in Sachs’ vision on a broad scale. In which case, stopping aid and pursuing other avenues for raising capital as Moyo advocates may still be the best way to spur economic development throughout Africa. Secondly, Moyo does not discuss the complexities of trade barriers thoroughly enough. There is little question that Western subsidies on agriculture create a severe impediment to growth throughout emerging economies. However, there is a valid geostrategic argument to be made for not removing the subsidies. Without subsidies, most Western countries would most likely import that vast majority of their food products, creating a potential weakness during conflict. Taking a realist perspective, removing trade subsidies would tilt the balance of power to countries that may violently challenge the Western hegemony, a risk not worth the increased growth in the developing world. There are also counterpoints to the geostrategic argument as well. A neoliberal would likely argue that increased economic prosperity will result in a greater adoption of democratic norms and then use democratic peace theory (democracies seldom fight each other, therefore, if every country is a democracy there should be relatively little war) to argue that concerns for the balance of power are largely irrelevant. Moyo merely acknowledges that there is a geostrategic argument but does not attempt to debase or critique it. Moyo, Dambisa. Dead Aid. New York: Farrar, Straus and Giroux, 2009.